New Boulder Club Night AND New Special Edition MixTape – Hip Hop! | DJPetey.com!!! New Boulder Club Night AND New Special Edition MixTape – Hip Hop! 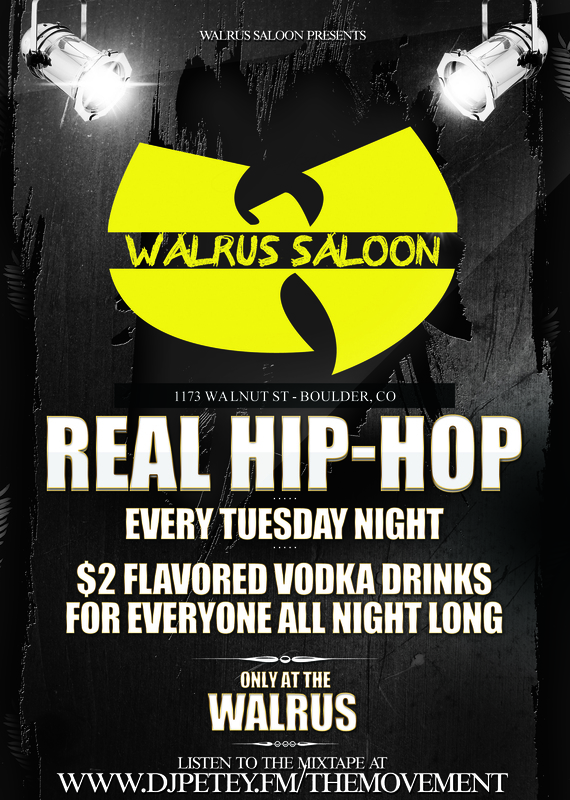 The Walrus is hosting Boulder’s newest club night every Tuesday Night starting THIS WEEK (Tuesday, March 31st, 2015). This is gonna be an all hip hop and all REAL hip hop night! New Kendrick and J Cole, etc etc etc and all the classics. Ive been wanting to do this for a long time and Walrus was nice enough to host it, so we’re gonna make some moves this year! They were also nice enough to give EVERYONE $2 vodka drinks ALL NIGHT LONG! We also put together a mixtape to launch the night. This is just volume 1. Weve got a lot of music to cover, so there will be more! To check out the mixtape now, go to www.djpetey.fm/themovement on any phone, tablet or laptop and check it out. 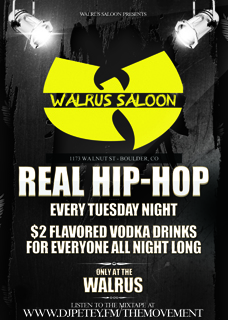 For those of you who have been complaining that there isnt a real hip hop night in boulder, I heard you! Get your asses out to the Walrus this tuesday night and support it! Click “read more” below for details on the mixtape. See you all Tuesday Night!